This is an ancient wood with small-leaved lime, hornbeam, ash, elm and coppiced hazel. Occasional work parties take place throughout the winter involving coppicing hazel to benefit wildlife and increasing the abundance of woodland flowers such as early purple orchid. Parts of the wood are relatively unmanaged giving a distinctively "wild wood" appearance. It has been designated a Local Wildlife Site through the Essex Wildlife Sites Project (reference number Bra172 Tarecroft Wood). Some of the coppiced hazel has gone to Hadleigh Country Park to be used in the creation of an Anglo Saxon Roundhouse. 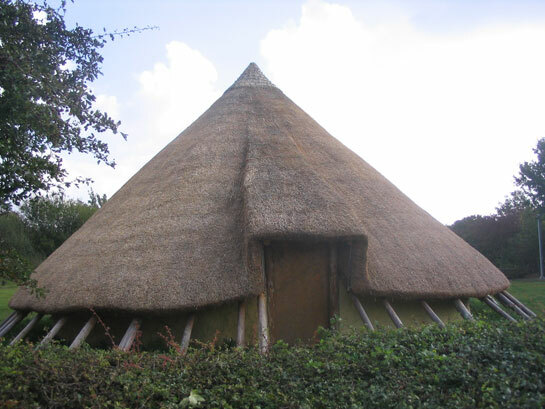 Hazel from Tarecroft Wood was used in the construction of this beautiful roundhouse built completely by volunteers and now used for educational purposes for schools. ​Some of our volunteers were fortunate enough to be involved in the early stages of construction.